Details emerged on 20th October of plans to take 238 hectares (nearly 600 acres) of Green Belt out of the heart of Woodford to make way for 2,400 new homes. This is in addition to 1,000 homes already approved on the Aerodrome site. 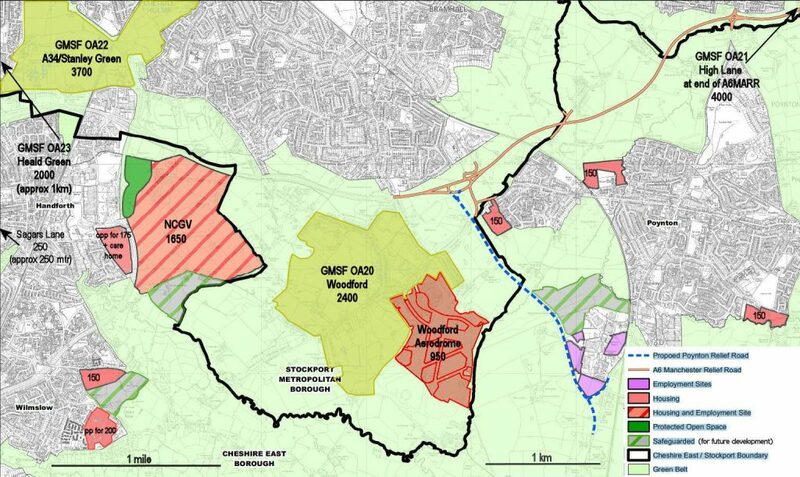 The area to be removed from Green Belt is shown in pink in the map below. It is a large area on either side of Chester Road, bounded by Old Hall Lane, the Aerodrome and Bridle Road in the south and by Church Lane, Moor Lane, Jenny Lane and Woodford Road in the north. Further information and the draft GMSF document can be found via the GMSF website, https://www.greatermanchester-ca.gov.uk/info/20081/draft_plan. Click on the link to the documents, then on Draft GMSF October 2016 Consultation in the table and then Read and Comment on Document. Information relating specifically to Woodford can be found in Section 28 Allocations, Subsection 28.8 Other Allocations and finally 28.8.20 Woodford. Paper copies can be viewed at Stockport Town Hall and Bramhall Library. Paper copies of the sections relating to Woodford can be viewed in the foyer at Woodford Community Centre.Our local MP, Mary Robinson, and local councillors Brian Bagnall, John McGahan and Mike Hurleston are all opposed to the proposal to take so much land out of our Green Belt, which is an asset used and appreciated by many people in Greater Manchester and neighbouring communities. 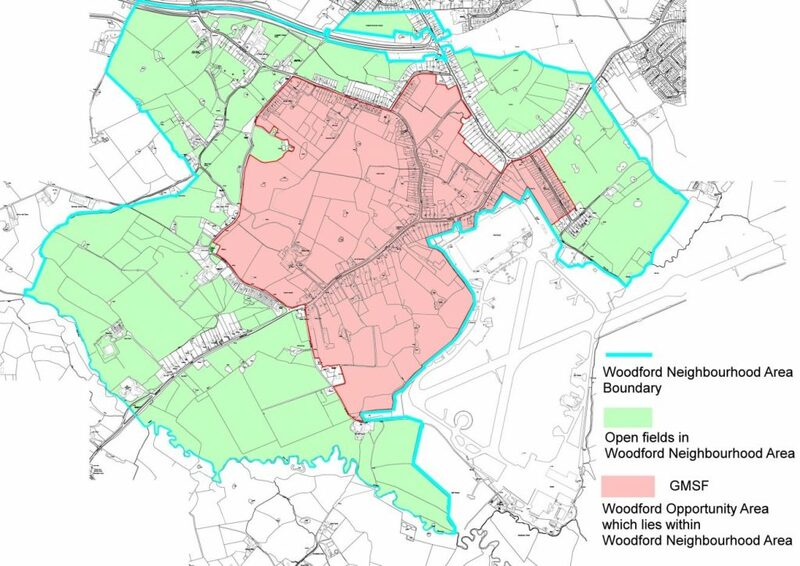 The management committees of your local organisations, Woodford Neighbourhood Forum (WNF), Woodford Community Council (WCC) and Woodford War Memorial Community Centre (WWMCC), will be doing everything they can to save the Green Belt in Woodford. WNF will be pressing on with the Neighbourhood Plan. By post: Greater Manchester Integrated Support Team, PO Box 532, Town Hall, Manchester, M60 2LA.